for $192,500 with 4 bedrooms and 3 full baths. This 2,716 square foot home was built in 1978 on a lot size of 0.62 Acre(s). 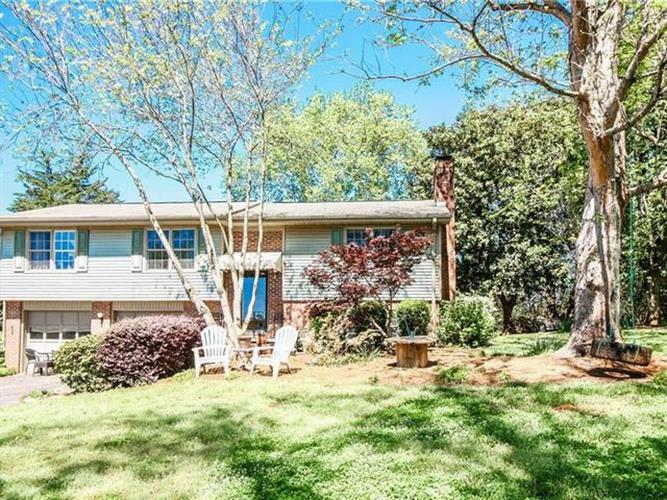 This charming, split-level home is situated on a level .62 acre lot, with shade trees, curb appeal and located inside in the established Tanglewood neighborhood. Once inside you will notice the spacious floorplan featuring a welcoming living area, where you will enjoy relaxing by the wood burning fireplace with an expansive rock hearth and a freshness of abundant daylight throughout. The open floor plan easily flows from the living area into the dining area with double doors opening into an impressive four seasons room. Off the four seasons room is a covered back deck overlooking your private backyard; an ideal space for entertaining or relaxing. The newly remodeled kitchen features quartz countertops, custom cabinetry and bar seating. A hallway leads to two bedrooms and a spacious full bathroom as well as your large master suite with full bathroom and lots of natural light. The lower level is complete with recreation room that could easily serve as an additional living space, workout room or home office. An additional bedroom, full bathroom and access from the two car garage with workshop space, laundry area and storage space completes the home's lower level. If that weren't enough, this home is located in a prime area convenient to Seneca schools, area shopping, dining, medical centers.